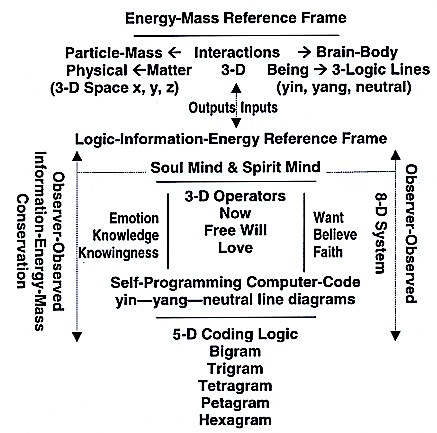 The 8-D system follows the I-Ching logic for designing the self-programming vacuum computer. Remember, today’s computer was invented with the binary logic of yin or yang, symbolized as 0 or 1. Notice, as shown in the diagram, there are three reference frames integrated together in a Holon. An observational frame of reference, often referred to as a physical frame of reference, a frame of reference, or simply a frame, is a physical concept related to an observer and the observer’s state of motion. … There are two types of observational reference frame: inertial and non-inertial. A further aspect of a frame of reference is the role of the measurement apparatus (for example, clocks and rods) attached to the frame … This question … is of particular interest in quantum mechanics, where the relation between observer and measurement is still under discussion. In this connection it may be noted that the clocks and rods often used to describe observers’ measurement equipment in thought, in practice are replaced by a much more complicated and indirect metrology that is connected to the nature of the vacuum, and uses atomic clocks that … must be corrected for gravitational time dilation. The two additional Reference Frames are brought about by the addition of the Being component. In clarifying this diagram, the Logic-Information-Energy Reference Frame needs to be further expanded upon, while further explanation of the Coding Reference Frame can be found in the other Posts and in the Book. One additional comment for the Coding Reference Frame is on its dimensions. The most important aspect of the Logic-Information-Energy Reference Frame is the mind state of the observer and perhaps of the observed. This mind state with its internal interactions is shown below. Observer’s Spirit of Love. A Strong Faith can dissolve the entire non-local free will field and all entanglements. It short, Co-Creation begins with a Strong State of Pure Love, which is a state of information crossover and energy collapse. Notice, the state of Want—Believe—Faith directly influences both the input-output process and its encoding logic. On the other hand, Believe–Faith–Love is connected to the concepts of Truth and Reality. Reality and Truth: What is true is real. What is real does not mean it is true. Reality is observer dependent. Truth is observer invariant and is a continuously approaching state. Reality and Belief: What one observes is a state of becoming, and depends on one’s belief. One’s belief may or may not be real. What is real may or may not be one’s belief. Reality and Faith: Faith with Knowingness and Love can create reality. Faith without knowingness is blind faith, while faith with knowingness is intellectual faith. Faith with Knowingness and Love is a state of Co-Creation. Faith in a Field of Free Wills: The success or failure of one’s free will in co-creating one’s reality, within a field of competitive free wills, has to do with the strength in collapsing one’s free will Holon, knowingness—faith—sticktoitiveness. Sticktoitiveness takes the place of Love.